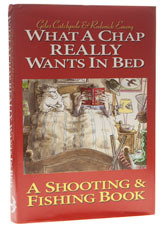 You have to hand it to whoever came up with the title for this one, because the answer is a collection of 125 fishing and shooting stories, originally published in Trout & Salmon and The Shooting Gazette respectively. When you add a foreword by a former publishing director of Cosmopolitan and wonderful cartoons by Olly Copplestone, the result is definitely worth a punt and I recommended this to anyone who would listen to me before Christmas. There aren’t many modern authors who can write credibly about shooting and fishing, let alone be amusing and allow us a ringside seat at some of their worst sporting moments, but this is what you get here. Best of all, the chapters are just the right length to give this one pride of place in the loobrary. Or possibly in the bedroom.